Bobby grew up in New Castle, Pennsylvania where he began his boxing career. In 1958, he was the Golden Glove Middleweight Champion of Pittsburgh, PA with a 24-1 record. In 1960, his family moved to Tucson for health reasons and he continued his “pro” career as a boxer, ending up with a 12-2 record. 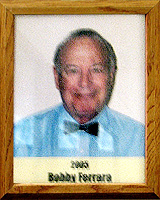 It was in 1971 when Bobby was approached about becoming a judge or referee for local boxing matches. His first bout as a referee was a four-round preliminary and he was hooked. For the next 34 years, Bobby would be officiating boxing matches all over the world. He has refereed more than 1000 matches, 36 of them for World titles. He refereed the fight of local Tucson legends Paco Flores and Johnny Rico when boxing was in its heyday in the 1970’s. As boxing lost its local popularity, he began to officiate Internationally including Germany, South Africa; Argentina; Mexico; France; and Japan. Bobby has trained amateur boxers as well as referees and judges at local gyms, and has officiated for the Police Athletic League (PAL); A member of the International Boxing Federation (IBF); the World Boxing Organization (WBO) and the Arizona-Nevada Boxing Commissions. The fights he has officiated are like a “who’s who” of boxing. They include: George Foreman; Fernanco Vargas; Michael Carbajal; Tommy Hearns; Boom-Boom Mancini; Hector Camacho; Roberto Duran; Julio Cesar Chavez; Gerry Conney; Ed Too Tall Jones; Ron Lyle, and Oscar De La Hoya and dozens more. With the resurgent popularity of boxing in Tucson, Bobby is in more demand now than ever. He has been ranked one of the Top-10 Referees in the World and is a member of the Arizona Boxing Hall of Fame.